First of all, I should tell you what a pleasant suprise I got a couple of weeks ago: Rhonda Buss of Rhonda’s Creative Life featured my blog, as well as Zoubi Zoubisou, in her Wednesday Showcase series! I have followed Rhonda’s blog for a while now and really enjoy getting to know new bloggers through her Wednesday Showcase posts. It is an honour to be part of the series now and a pleasure to be able to welcome new readers to my blog! Burda 02/2005 #128 (without colour blocking). I have worn this skirt out and about several times already, but forgot to take pictures, so I ended up with boring kitchen photographs again. 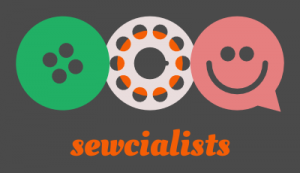 This past month I barely touched my sewing machine, there were just too many deadlines and other distractions (and I am afraid it will be like that all summer). With a couple of relatively calm days ahead, I figured it was time to finish the projects I started earlier this spring. The weather has really warmed up lately, though, and the sweaters in solid and dark colours that I cut out seem very dreary and boring now. Instead I wanted something colourful, something with a bold pattern. And something that could be completed in a short amount of time, so it would not end up on the ongoing projects pile. 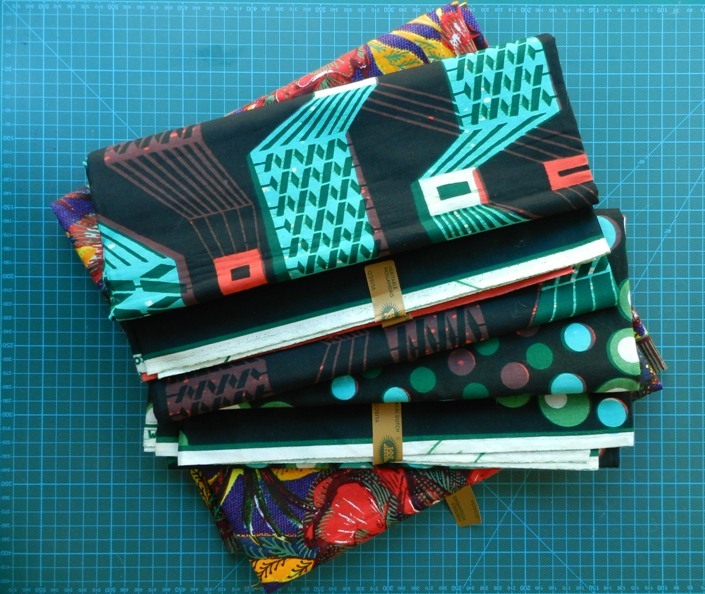 It did not take me long to decide on the fabric: one of the pieces of Dutch Wax that my mum bought me when we visited the Vlisco Factory Outlet in Helmond in December. 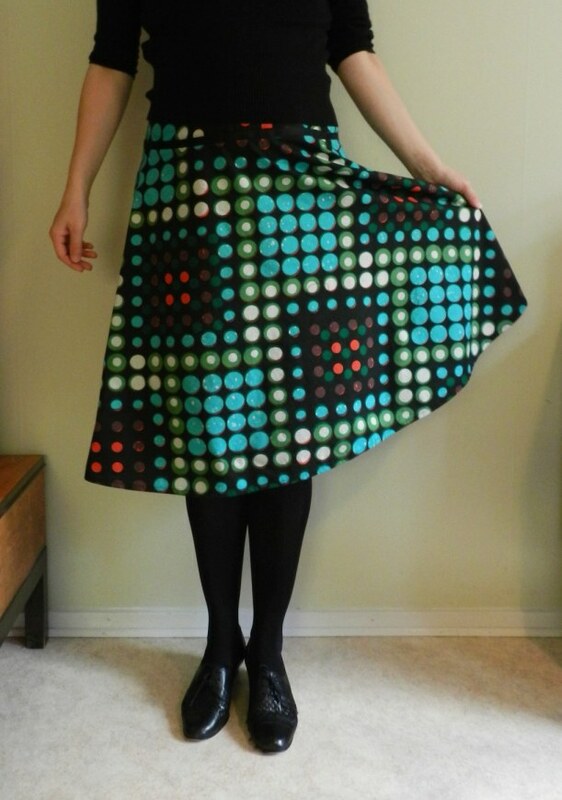 Because I wanted something fast and appropriate for summer I knew it had to become a wide skirt. 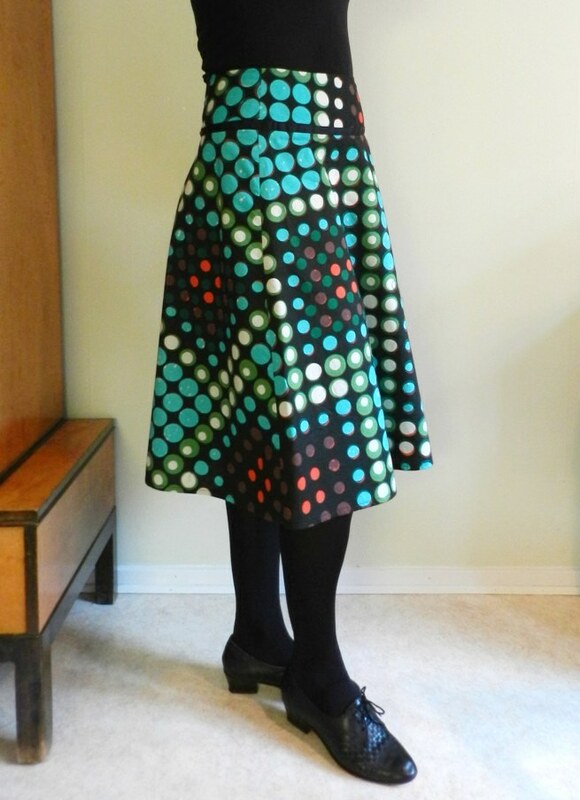 As I did not want to break up the large-scale print, but still make a skirt that is somewhat fitted around the waist, I picked #128 from Burda 2/2005. 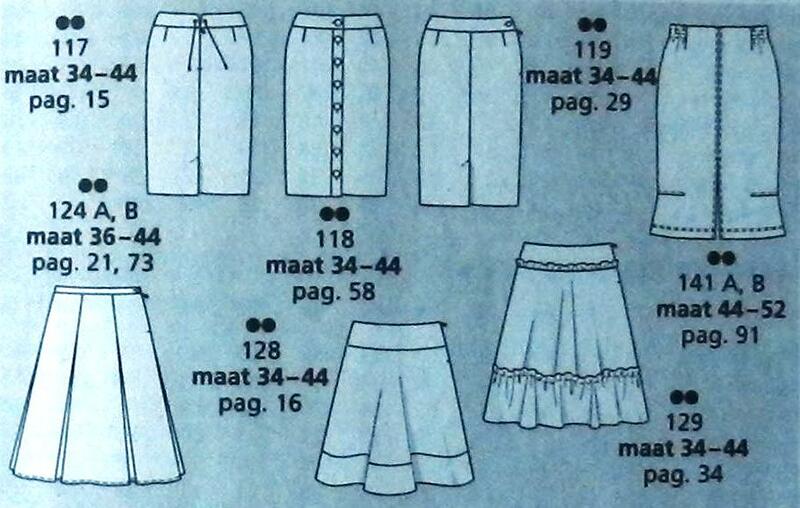 Skirt patterns from Burda 02/2005. So far, I have made #124, #128 and #129. I think #124 is worth revisiting too. This is my fourth rendition of this pattern, the first three versions were made between eleven and seven years ago, so it had been a while. 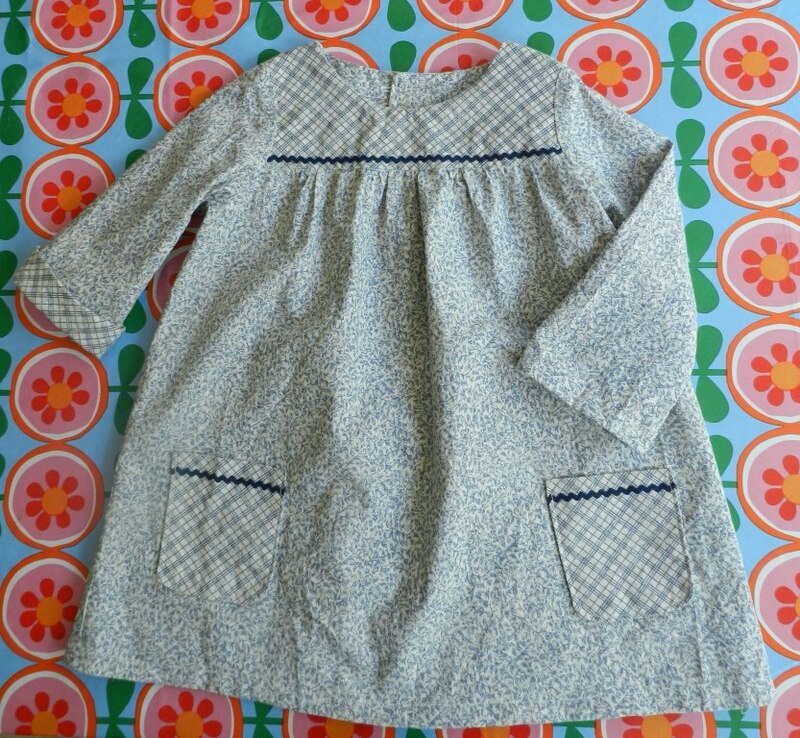 Nevertheless, this pattern has so few pieces and is so easy to assemble that there was no need to consult the instructions. The only thing that took me several tries to get right was lining up both sides of the skirt when inserting the invisible zipper. I can honestly say that I still love this pattern as much as when I first made it. It is great for showcasing bold prints and while it is simple, it holds enough possibilities for colour blocking, adding ruffles and trims so you can end up with a different skirt each time. The fit is great too. 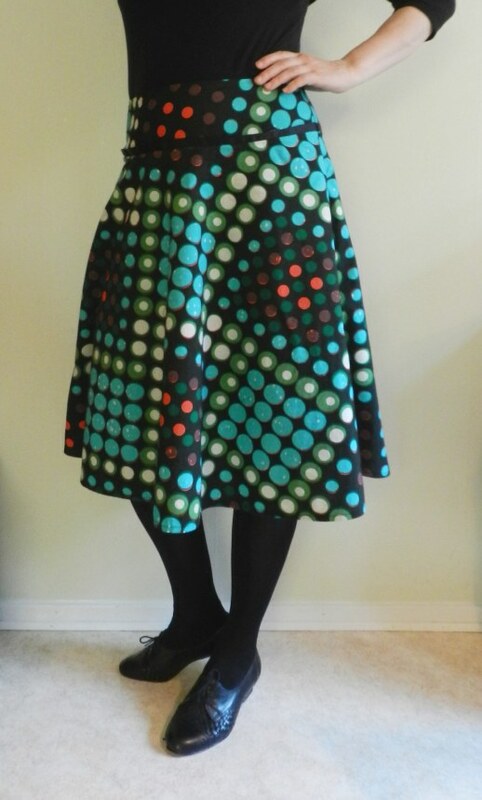 I adore wide skirts, but do not feel comfortable with a bunch of gathers or pleats flaring out from my waist, so I favor skirts with some kind of yoke or pleats that open up below the waistline (but above the widest part of my belly!). Pattern matching on the side seams was difficult seeing that the checks are asymmetrical and placed at a 45 degree angle, but I cannot say it bothers me too much. 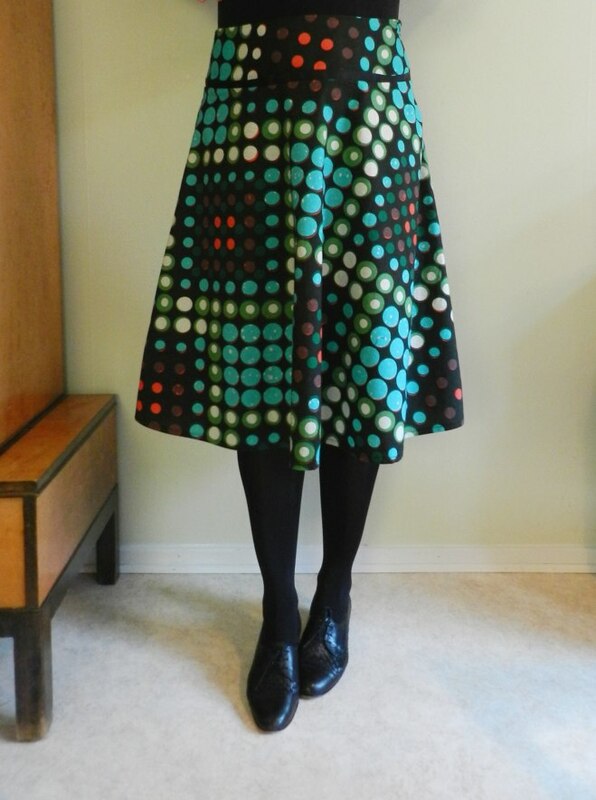 The prints on the yoke and skirt pieces match quite well but not perfectly, so marking the division between yoke and skirt instead seemed like a good idea. I am not very experienced at inserting invisible zippers. At least the ribbon lines up perfectly, but there is still some pulling at the side seams. 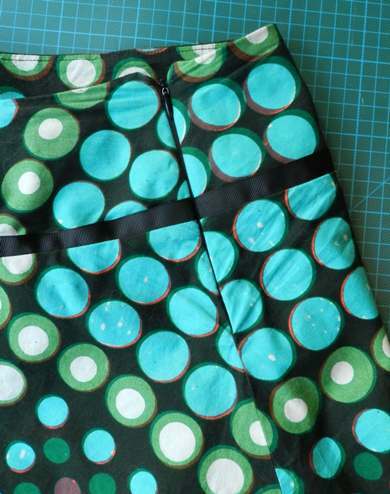 Fearing that a thin line of piping (like I used on the watermelon skirt that i made last summer) would get lost in the print, I opted for something a bit more substantial: grosgrain ribbon. The ribbon is synthetic and a bit cheap-looking, but it was the only black ribbon in my stash that was wide enough. From a distance it looks fine, though. Funnily, this is the second pattern I have completed lately that comes from the February 2005 issue of Burda (the other one being last month’s sailor pants. 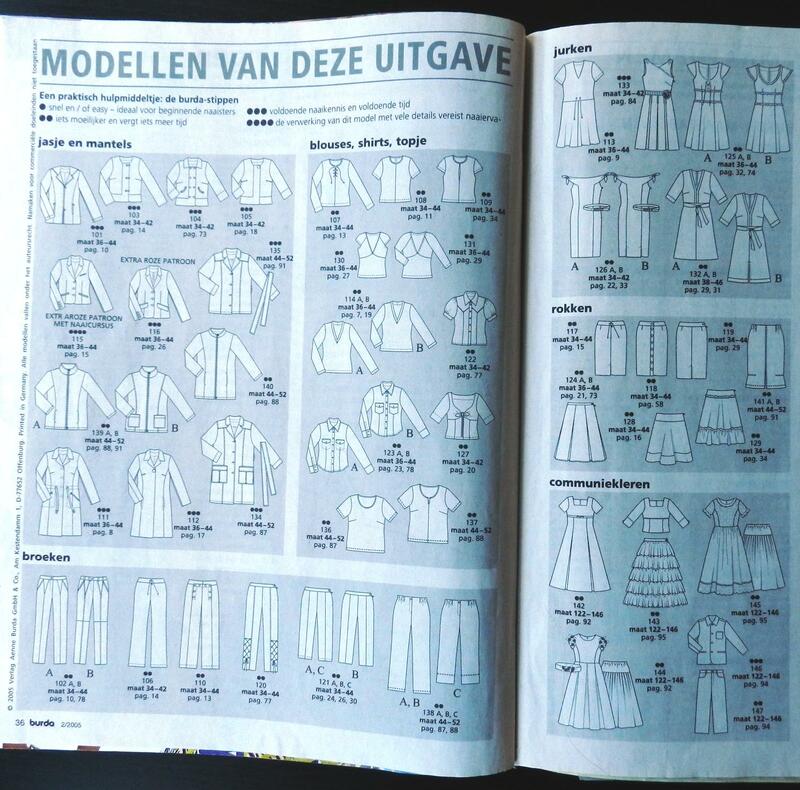 With a total of six completed garments (and one UFO), this is probably the most fruitful magazine in my stash and there are still a couple of patterns I would like to try out or revisit. Hold on to your old Burdastyle magazines, people! Pattern overview of Burda 02/2005 (click to enlarge). Last month’s sailor pants are pictured to the bottom left. Blouse #122 is a UFO, but worth finishing if it still fits. 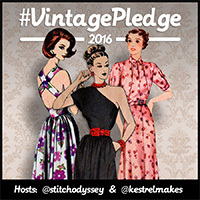 I have loved dress #133 since I first laid eyes on it and think it is about time to make it! Very low! The fabric was a present. (It was less than 15 Euro for 2 yards at the outlet and I used up most of it). The zipper was 8.5 Sek (about 90 cent), because I bought ten at once. The grosgrain ribbon came wrapped around a present. The thread and interfacing were cheap, perhaps I used for about 1 Euro. Lovely! That’s a really fun fabric. Thank you! Yes, it is really the fabric that steals the show here, the print is pretty awesome! Thank you, Siri! 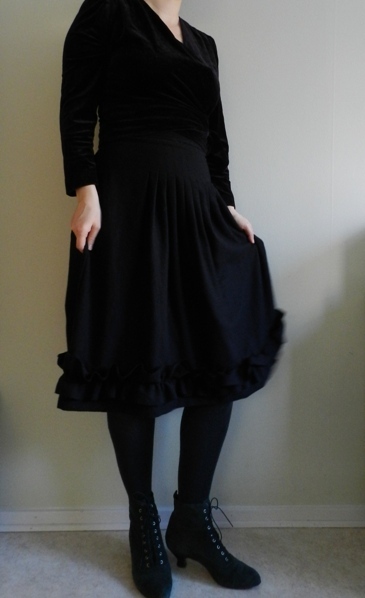 I think skirts with gathers or pleats starting at the waist look really cute on other people, but my waist is not that defined (I usually have to grade out at the waist), so I feel skirts with yokes are more flattering. And I often like to wear tops over my skirts instead of tucked in, which tends to become a bit bulky with pleats or gathers starting at the waist. What an awesome fabric. 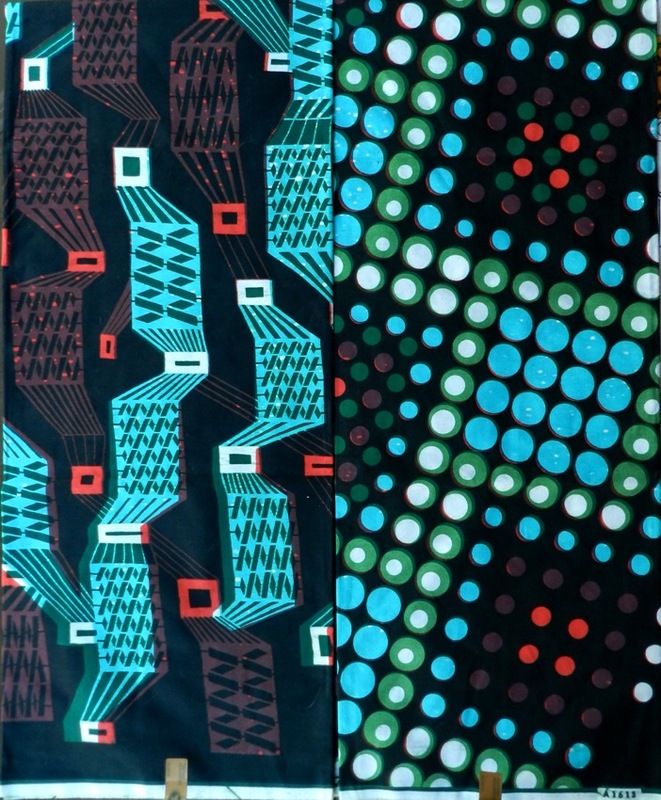 I really like garments that feature bold, engaging patterns like this, as they feel, to me, like wearable works of art. Great job on this skirt, Iris. It’s a total delight! Thank you so much, Jessica. I really like the idea of it being a wearable work of art!